From last few days, I was thinking about writing a series on Queries\T-SQL commands that we use in our day to day operations or those queries which should be handy for any SQL DBA(Junior or senior) out there. In this series, I’ll try to share as many queries as I have or I use. There are 1000s features in SQL Server and each feature has its own set of infinite queries so any blog cannot cover all queries and all features but I will try to cover the queries that is needed in our day to day activities as a DBA. Comments are most welcome by readers which can also enhance my database of queries. So here goes first part of this series. Note :- I would like to thank countless sites and articles present there on google which helped me save all these queries to my personal QUERY DATABASE. This series is for knowledge sharing pupose only and you can share these queries again to your colleagues and friends. All Database files in a Instance with location : This query lists all the database files present in a Instance. Output of this file contains Logical filename and its physical path in the server. I shall be back with more queries soon. Please comment your views. Thanks for reading!! How to get access on SQL Server if you don't have "sa" password or sysadmin access? 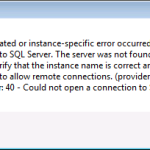 How to enable remote connection to SQL Instances from single SQL Server Management Studio? How to check SQL Server connection without SSMS?